Welcome to this 8th issue of Manuscript - a bumper issue for sure. There has been lots happening in the last couple of months and with much more in the pipeline, I'm sure you'll enjoy reading our news. I have mentioned in this column several times previously that we were going to launch our own pen brand and at last, it's here! 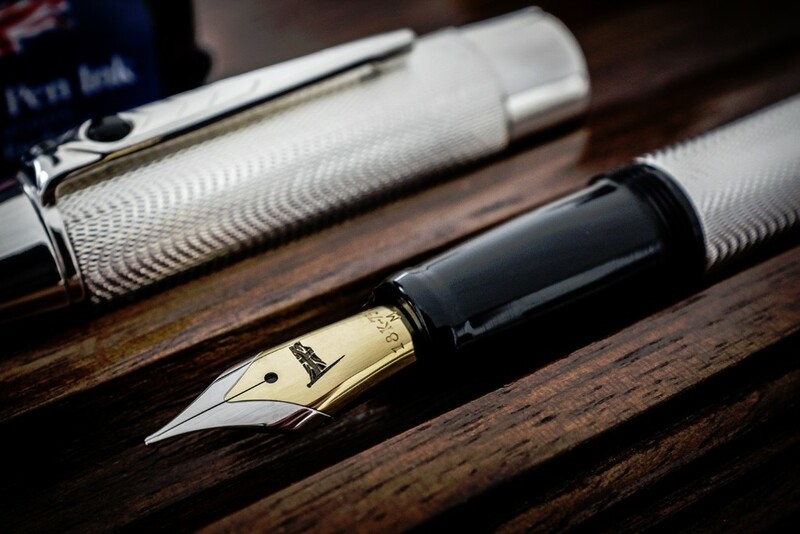 The Stratford Pen Company has been officially launched, named after Stratford Upon Avon in England where the world’s most famous writer, William Shakespeare, was born. So the first Stratford release just had to be “The Shakespeare Pen” - especially as it coincides with his 400th anniversary. It really is a beautiful British pen; hand-made in hall-marked sterling silver, perfectly balanced and just the right weight for everyday writing. The classic “Silk” engraving is genuinely engine-turned. We are sure The Shakespeare Pen will become another British masterpiece, and it is already receiving world-wide acclaim. 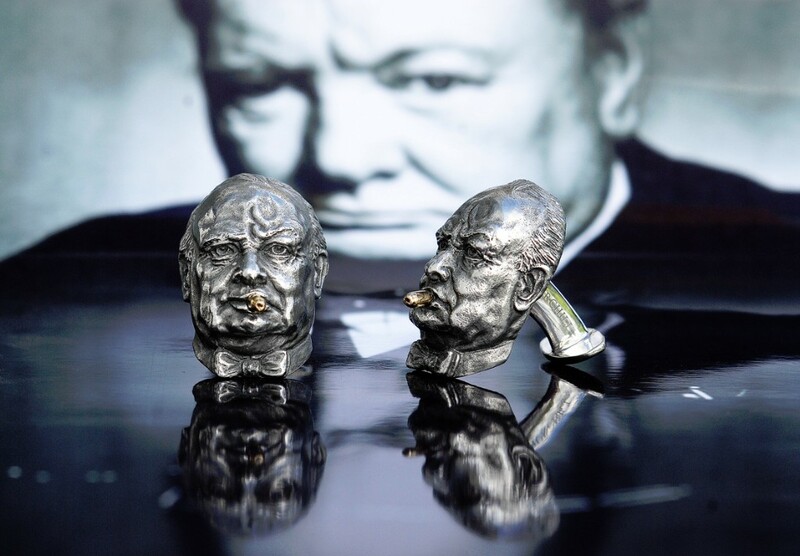 More than that, we are delighted to report that The Shakespeare Pen has been chosen by the British Council and the government's GREAT Britain campaign to represent British manufacturing in support of their 'Shakespeare Lives' promotions and events during 2016. Using the power of Shakespeare’s 400th anniversary year, 'Shakespeare Lives' is raising funds to support VSO's education programmes around the globe and leave a lasting legacy and a brighter future for hundreds of thousands of children. As a result, BBP has agreed to make a worthwhile donation to VSO from the sale of every Shakespeare Pen - a very worthy cause, I think you will agree. 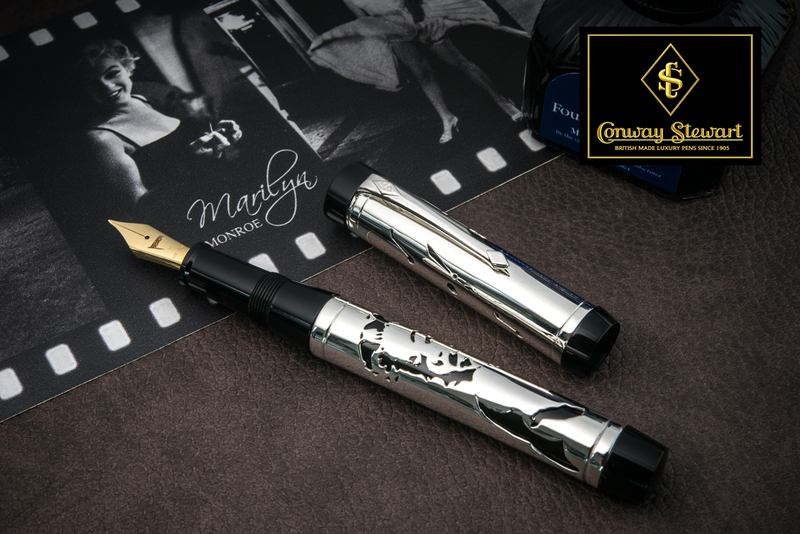 Next up is a quick review of the various new Conway Stewart pens we have released since the last newsletter, including the fabulous 'Marilyn Monroe' pen with exquisite overlay by Henry Simpole. I know many of you were disappointed to miss out on the Conway Stewart 'Kingsman' pens - we had only a handful which featured in the Kingsman film starring Colin Firth and Sir Michael Caine in 2014. Well, we were recently approached by the film company who are now filming 'Kingsman 2' and who wanted some more pens. Naturally, we were happy to oblige! The new Kingsman pens are based on a different model but still have some very special features! Take a look at the trailer for the original Kingsman film and you'll notice the original pens which were based on the Winston model - https://www.youtube.com/watch?v=hN0JkFrvO_M. As soon as the trailer for Kingsman 2 is out we will send you the link in a future issue of 'Manuscript', and watch out for the new Kingsman 2 pens which will launched in 2017. We are currently making bespoke pens for a number of high profile car manufacturers including Rolls-Royce, David Brown Automotive and Overfinch. If you are looking for a Bespoke pen for your business, please contact our MD, Alastair Adams, alastair@bespokebritishpens.co.uk and he will be pleased to visit you and discuss your design requirements. 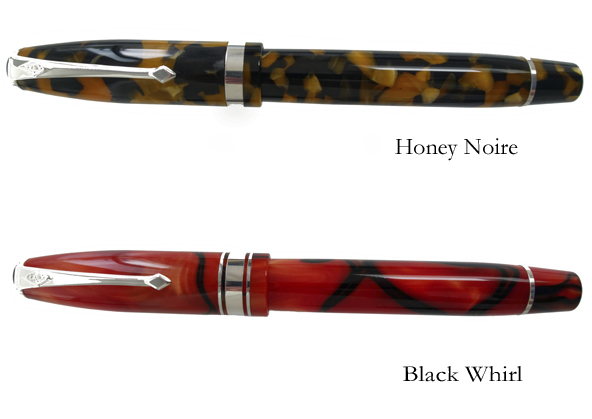 You will find more details on our website http://www.bespokebritishpens.co.uk/corporate/. As you can see, there's certainly a lot going on in BBP and if you enjoy 'Manuscript', please forward a copy to your pen friends and colleagues and express your enjoyment by 'liking' us on Social Media. You'll find all the links at the bottom of this email. It all helps to spread the word! As English as The Bard himself! 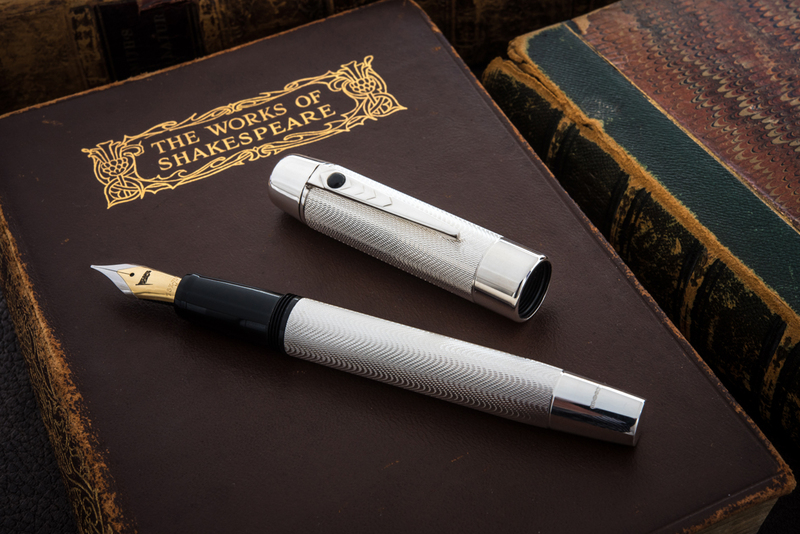 The Shakespeare Pen has been designed and handcrafted in England by The Stratford Pen Company's highly talented silversmiths and pen technicians who have incorporated the essence of the world’s greatest playwright into a fountain pen that’s as English as the Bard of Avon himself. Classically elegant in design, The Shakespeare Pen is made from Sterling Silver and bears a full set of English hallmarks to confirm its quality and purity. 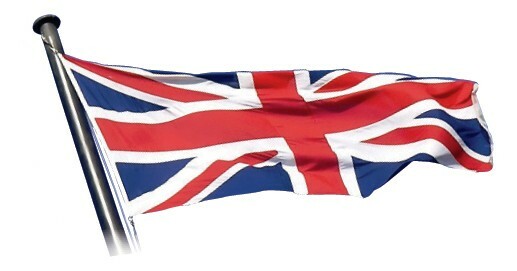 English hallmarks have been used as evidence of purity of precious metals since 1544, well before Shakespeare was born. On the end of the cap is an image of William Shakespeare which has been taken from the title page of his First Folio, published in 1623. 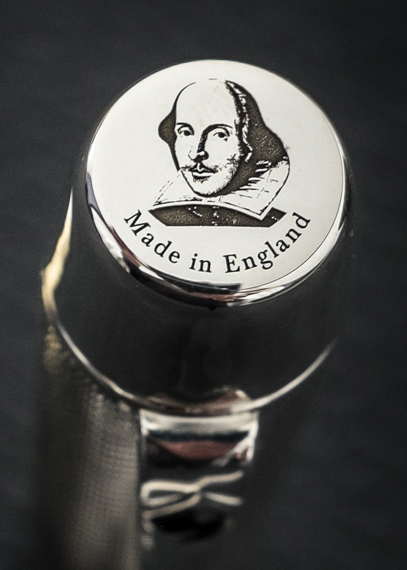 ‘Made in England’ is also engraved on the cap top to reflect that not only is the pen made in England, but so was the world’s greatest playwright! The award-winning Churchill model is now available in Azure acrylic, a beautiful mixture of purple and Mediterranean Blue flecks with paler and darker shades throughout and your choice of either solid Gold or Sterling Silver fittings. 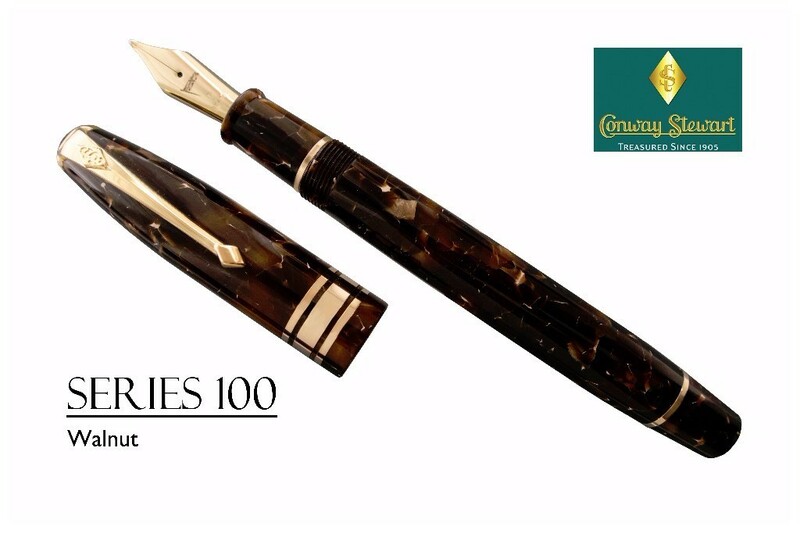 Here is the latest Conway Stewart Series 100 ‘Special’ to be issued by Bespoke British Pens. This time it’s a stunning Cherry Red acrylic that looks sensational when combined with the gold fittings. 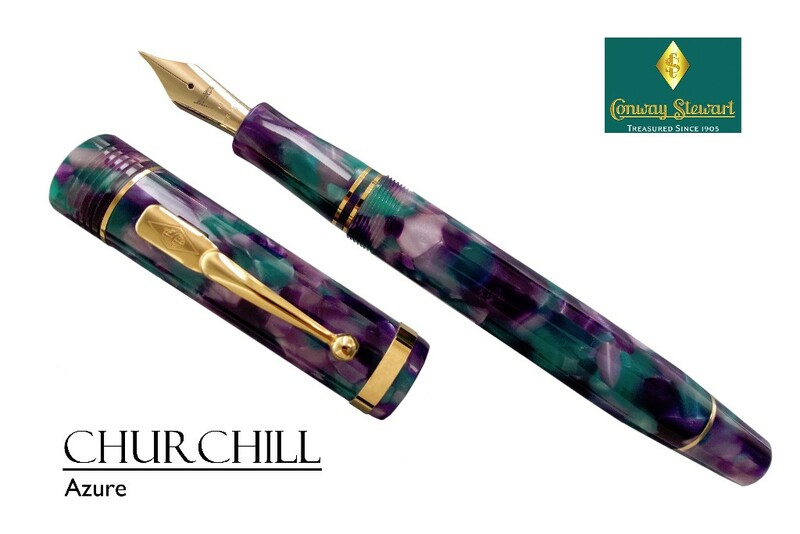 Here is the latest Conway Stewart Series 100 ‘Special’ to be issued by Bespoke British Pens. This time it’s using a subtle walnut coloured acrylic – a mix of darker and lighter shades of brown offset with polished gold fittings that complete the overall top quality feel. 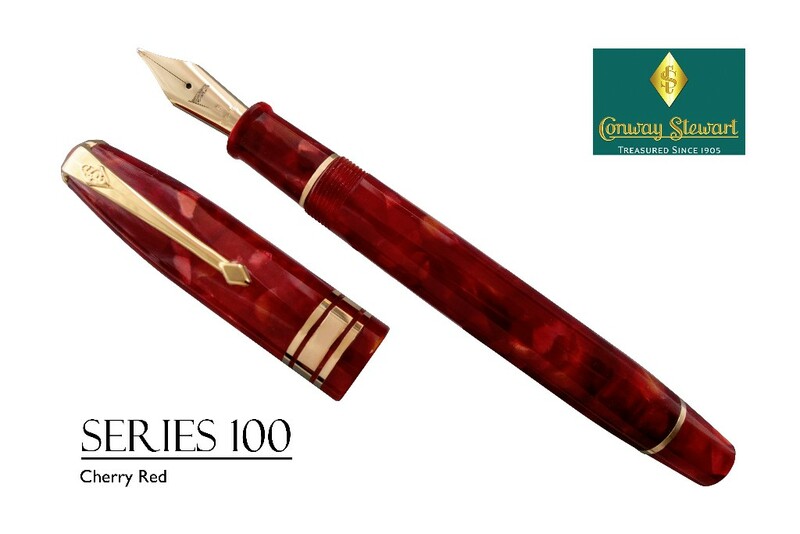 "I have received my Conway Stewart Series 100 Cherry Red. Wow! It is very beautiful. I am very impressed. This is an outstanding pen, a real masterpiece and the color is just wonderful! I enjoy it very much. CONGRATULATIONS for your outstanding work." Honey Noire has almost legendary status in the Conway Stewart back-catalogue. Not quite tortoiseshell; not quite amber; it is instantly recognised as a CS classic. Only 4 left. Full details here. The Black Whirl is sure to grab attention. Its fiery red acrylic base is the perfect foil for the swirling black streaks offset with polished silver clip and bands. Last 2 now available. Full details here. Prefer gold fittings? Call or email - we are always happy to make up one specially for you. 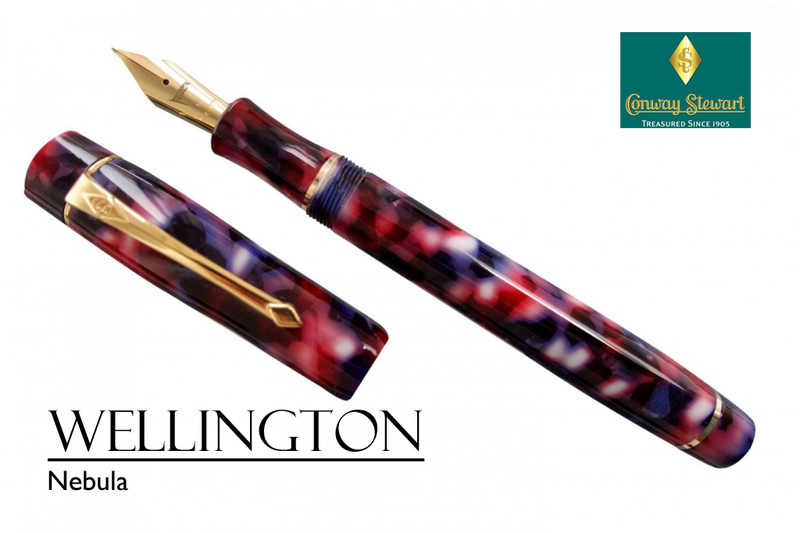 The Wellington Nebula is a whirlpool of blues, reds and purples interspersed with accents of pearlescent white that makes it a long-time favourite of many Conway Stewart collectors. Only 12 available. Full details here. “Have just received my first purchase from Bespoke British Pens, a Conway Stewart Churchill in a glorious burgundy colour, fitted with a medium Flag nib. The buying experience was nice and easy with almost instant confirmation of the order with a friendly email from David Cooper. The pen was despatched at my request to my works address and once again I had an email confirming despatch and supplying the tracking number. The pen arrived well packed and in a nicely designed Conway Stewart box that was so much better than the over the top boxes Conway Stewart themselves used to package their pens. As for the pen itself, it is exactly what I wanted and expected. The colour is spectacular and I am thoroughly enjoying the medium Flag flexible nib. Despite the large number of new issues over the past few months, there are plenty more in the schedule for the remainder of 2016 to look forward to. In no particular order, there's the Poppy pen, our tribute to the Somme Centenary; more Shakespeare Pen range releases, new Conway Stewart Series 58 models and several more special editions of the Series 100 and Churchill ranges including rollerball and propelling pencil options. In addition, we will soon release details of the Conway Stewart Raleigh in Graphite - a super looking pen that just oozes class. And then there's the Conway Stewart Jaguar edition - nothing to do with the car manufacturer, more the South American 'big cat'. We have been able to assemble a handful of this magnificent pen which is made from sterling silver with colourful enamelling. I'm sure you'll love it. There will also be more additions to our accessories range with new leather pen cases available very soon. If you would like advance notice of any of these new releases, just send an email marked 'New Releases' and I'll make sure you'll be the first to receive information about them. Thank you for taking the time to read this issue. Please forward it to your pen friends and contacts and click on the buttons below to share it on Social Media. Copyright © 2016 Bespoke British Pens Limited, All rights reserved.